The Place Located within Goodwood Park Hotel, Alma by Juan Amador is a One-Michelin starred restaurant which serves Asian influenced Modern European cuisine. The setting of the restaurant is contemporary and fine dining style, so it is quite the ideal date night spot or a celebratory occasion. Alma actually means soul in Spanish, where the One-Michelin starred restaurant was renamed and rebranded as Alma by Juan Amador only three years ago. The Food Helmed by Chef Haikai, the restaurant launches a new dinner menu recently as part of its third anniversary. The new dinner menus come in 4-course (S$117++), 6-course (S$158++) and 8-course (S$197++) options. Lunch sets are definitely more value for money, with 3-course at S$39++ without the snacks and petit fours at the end unlike dinner. The meal kick-started with some interesting snacks. First up is the Strawberry chips with curry leaves powder and ricotta cheese, which I remember the curry flavour to be quite pronounced. The second snack is the Baked olive chips, with Roma tomato tartare in the middle and topped with crispy kale leaves. This is like the crispy chips I wish I have at home to brave through the Netflix serials. The third snack pays homage to the Singaporean toast bread culture. Inspired by our local Yakun toast, the toast lookalike here is in fact coffee meringue, with chicken liver parfait sandwiches in the middle to resemble butter. It may come across as gimmicky, but interestingly this also reminds me of the kaya toast ice cream I had at restaurant Labyrinth, also a One-Michelin starred restaurant. The last snack is somewhat like a Homemade sable biscuit marinated with chilli, lemongrass and lime, along with crab meat with tom yum spices and yogurt parfait. This is the most punchy snack from the tom yum flavour, and quite the enjoyable and promising one to officially start the meal proper. After the interesting snacks, we were served the Homemade potato bread with unpasteurised, lightly smoked French butter in a lovely wooden box. The first thing I noticed is the warm texture of the bread, which is baked with coffee beans. I usually go easy on bread as I do not want to affect my appetite of the rest of the dishes. However, this freshly baked bread and butter is so good that I had three of it! I started with the Muirgen Oyster, which turned out very different from an outright oyster I expected. This oyster dish is presented in the form of a duo-layered chawanmushi style. The creamy homemade sauce here is accompanied by uni, truffle jus and topped with crispy kale. The dish is very aromatic, and the overall creamy texture and umami flavour makes it a very enjoyable starter. Next up is the Okayama Muscat Grape Chutoro is a refreshing dish. It’s a mix of Okayama green grapes and Hokkaido uni, with chutoro cubes mixed within. For the meats, I love the Iberico Pork Jowl. The pork here is glazed with aka miso and sous-vide, then grilled on binchotan. It is served along with crisp artichoke and black sesame purée, which adds another dimension to the flavour. The broth here is very good, full of umami from the Jerusalem artichoke purée with pork reduction. The last savoury course I had was the Ohmi Beef, one of the best wagyu beef in Japan. 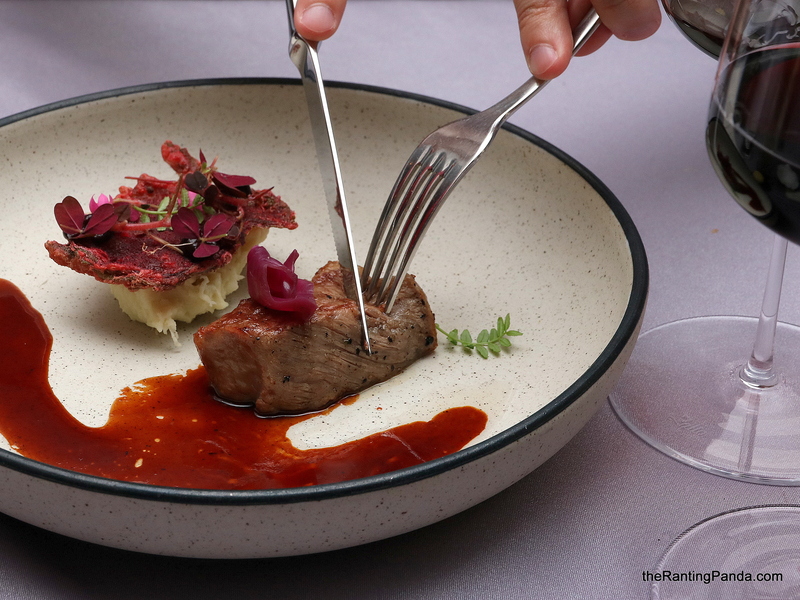 Served with wine and beetroot reduction, horseradish potato and crispy seaweed, the wagyu beef is very succulent and flavourful. I like the presentation of the dish, with very well-coordinated colours. The crispy seaweed along with the potato makes a great combination too. For dessert, I had the Mango, which is a beautiful combination of mango cremeux, yogurt with myoga (Japanese ginger). There’s also this layer of crispy biscuit-like texture at the bottom which tastes like peanut butter! Overall, it is quite a refreshing dessert to cap the meal. The last part of the meal is the Petit Fours. Expect the likes of Durian mochi with yuzu; Frozen soursop with cocoa dips; Coffee meringue, orange jam, foie gras parfait and calamansi gel; Beetroot purée with raspberry, lavender cream and beetroot powder; and Chocolate with Gula Melaka financier. Rants I feel that the current look of the space is a little dated. Will I Return Again? I am impressed by the food at Alma. Every dish is consistently good and well-executed, and it deserves the Michelin accolade. While prices are not cheap, it does make the cut for that special occasion or business lunch. Make your reservations instantly at Alma by Juan Amador here.